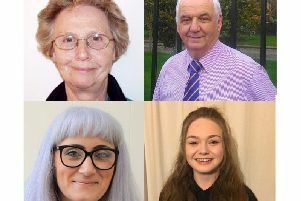 Sunderland local elections: Who will get your vote in Washington West? Washington West candidates, from left, Olwyn Bird, Bernie Scaplehorn and Benjamin Green. Not pictured: Lynn O'Neil, Jo Thomas. The countdown to the May 5 local elections is underway. Here are the candidates who’ll be seeking your vote in the Washington West ward for Sunderland Council. I am the Conservative Party candidate for Washington West, was born in Sunderland and for the last 19 years have lived in Washington. For over forty years this council has been in charge and quite frankly it is time for a change, we have seen in the last few years, one disaster after another, money wasted on surveys, huge payouts to ex employees, the children’s service debacle and no one yet accountable, the car park that cost a fortune, then dug up after two years to make way for a road (where was the forward planning in that). The list is endless – and goes on – we must put a stop to it. If elected, I will do my utmost to support the fight to stop the continued erosion into greenbelt sites, especially the horrendous number of houses proposed for Springwell. (Sunderland Council need to think good and hard on that one. ( Please use your vote. 42% of the electorate in this ward didn’t at the last election, it could make a difference. No profile information or picture was supplied to the Echo by candidate. My name is Bernie Scaplehorn and I have had the honour of serving Washington West for the past eight years, having lived in the ward for nearly 40 years and brought up two boys in Blackfell. I know the area well and am acutely aware of the concerns of residents within our ward. Having served as a school Governor at Blackfell Village Primary school and Springwell Village Primary school, education remains a priority for me if I am re­elected as your representative in May. Having founded and successfully run Blackfell Neighbourhood Watch for 20 years, I have extensive knowledge and experience working with partners to successfully tackle anti-social behaviour and crime within our communities. My hope is to involve our children at a young age and bring respect back to our villages. Vote Scaplehorn on May 5. I live in Springwell Village where I have raised my family and am active in village life. I am involved with the campaign to protect our green spaces. If elected as the new councillor for Washington West (covering Albany, Blackfell, Donwell and Springwell Village) I will be a strong voice for local people, fighting to make sure that Sunderland Council listens to local residents and their concerns. At the moment I am concerned that too many decisions about our area are made remotely at Sunderland Civic Centre. We need a strong voice for Washington on Sunderland Council, and a strong opposition voice too. If elected I will work hard all year round - not just turning up at election time – will keep in touch and reflect the views of local residents, and will be a strong opposition voice on the Council. lPublic ownership of public transport, so that it serves the needs of its users and not private shareholders. lSecure jobs that pay a living wage, to eliminate the need for taxpayer subsidising of exploitative employers. lInvestment in more affordable housing. A vote for a Green candidate is a vote for the common good.